Foles is signing a four-year, $88 million deal with the Jaguars, Ian Rapoport of NFL Network reports. 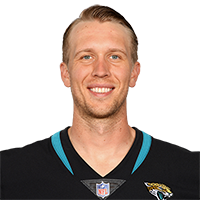 Analysis: The Foles to the Jaguars connection has been rumored since early in the offseason, but now it appears a deal will be made official once the new league year begins. The money and duration of the contract suggests that the Jaguars view Foles as a long-term solution, which should end speculation of the team using an early draft pick on quarterback. Foles completed 72 percent of his passes with seven touchdowns and four interceptions over five games with the Eagles in 2018. 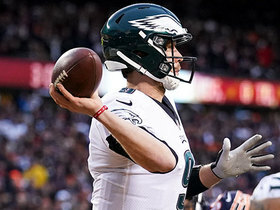 Foles is expected to sign with Jacksonville when the new league year opens next week, Dan Graziano of ESPN.com reports. The Eagles won't use their franchise tag on Foles this offseason, Mike Garafolo of NFL Network reports. Analysis: The decision officially sets Foles free and will allow him to hit unrestricted free agency in March. 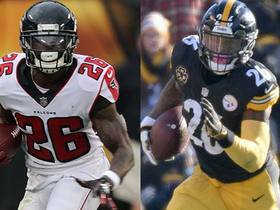 There's no question there will be a strong market for the former Super Bowl MVP, who should at least get the opportunity to compete for a starting role wherever he lands. Foles declined his $20 million mutual option for 2019 on Tuesday, Adam Schefter of ESPN reports. The Eagles picked up Foles' $20 million mutual option for 2019 on Tuesday, Tim McManus of ESPN.com reports. Analysis: Foles now has five days to accept the option or decline and pay back $2 million from his 2018 bonus to become a free agent. Things get a bit messier should the veteran quarterback pick up his side of the option, as the Eagles' dire cap situation makes it difficult to carry such a high cap figure heading into the 2019 season, as they would attempt to work out a trade. Regardless, Foles will assuredly be sought after given his performance in Philadelphia the past two seasons. 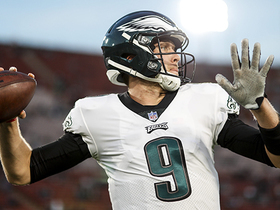 The Eagles are expected to pick up Foles' $20.6 million option for 2019, Ian Rapoport of NFL Network reports. 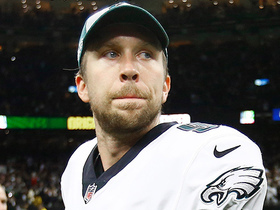 Foles completed 18 of 30 passes for 201 yards with a touchdown and two interceptions during the Eagles' 20-14 divisional-round playoff loss to the Saints on Sunday. He also netted zero yards on two rushes but scored a one-yard touchdown. Coach Doug Pederson confirmed Monday that Foles would remain the Eagles' starting quarterback for the team's matchup with the Saints this weekend in the NFC divisional round, Zach Berman of The Philadelphia Inquirer reports. 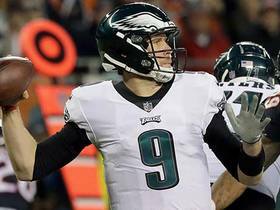 Foles completed 25 of 40 passes for 266 yards, two touchdowns and two interceptions in Sunday's 16-15 wild-card-round win over the Bears. Foles (ribs) came out of Thursday's practice unscathed and should be good to go for Sunday's wild-card game at Chicago, Jeff McLane of The Philadelphia Inquirer reports. Analysis: Foles was able to return to full participation at practice Thursday as his bruised ribs apparently didn't cause much of an issue. The veteran quarterback will serve as Philadelphia's starter with Carson Wentz (back) likely sidelined for any potential playoff run. The 29-year-old will hope to recapture the same form that helped him lead the Eagles to a Super Bowl victory last season, but has a tall task against a Bears defense that hasn't allowed more than 17 points in the last four games. Foles (ribs) participated fully in Thursday's practice session, Dave Zangaro of NBC Sports Philadelphia reports. Foles (ribs) was listed as a limited participant on Wednesday's estimated practice report, Martin Frank of The Delaware News Journal reports. Analysis: Foles has already been named as the starter for Sunday's playoff game in Chicago. His bruised ribs may still be a bit sore coming out of the Eagles' Week 17 win over the Redskins, but his availability for the wild-card round isn't in any question. Coach Doug Pederson said Foles (ribs/chest) will start Sunday's playoff game in Chicago, Zack Rosenblatt of NJ.com reports. Foles was diagnosed with bruised ribs after undergoing additional testing Monday and is expected to be ready to play in the Eagles' matchup with the Bears in the NFC wild-card round this weekend, sources told Mike Garafolo and Ian Rapoport of NFL Network. Foles is slated for additional tests Monday on the chest/rib injury he suffered during Sunday's 24-0 victory at Washington, Jay Glazer of Fox Sports reports. Analysis: Foles made an abbreviated exit early in the fourth quarter, and while he has yet to receive an official diagnosis, there's a belief that he suffered bruised ribs, per Adam Schefter of ESPN. X-rays and an MRI likely are on Foles' docket Monday, at which point the nature of the injury will become known. Despite the health concern, the Eagles think Foles will be fine for a visit to Chicago in the wild-card round next weekend. Foles is believed to have suffered bruised ribs during Sunday's 24-0 win at Washington, Adam Schefter of ESPN reports. Analysis: In back-to-back weeks, Foles took some tough hits in the second half, incurring injuries to his torso. The initial diagnosis appears to be to his ribs, but the Eagles' medical staff will hone in on the nature of the issue in the coming days. In his stead, Nate Sudfeld finished off the victory Sunday, but Foles will be under center in the wild-card round if the team reaches the postseason in the event of a Vikings loss to the Bears. Foles exited Sunday's game against the Redskins with a chest injury. Analysis: Foles walked to the locker room early in the fourth quarter, but it remains unclear when exactly he sustained the injury. Nate Sudfeld has taken over at quarterback as the Eagles lead 24-0 midway through the fourth quarter, so the team is unlikely to bring Foles back if there is even slight concern for his injury. Coach Doug Pederson confirmed Monday that Foles' ribs are fine and that the QB will start this coming Sunday's game against Washington, Jeff McLane of The Philadelphia Inquirer reports. Analysis: Per ESPN's Tim McManus, Foles -- who took a hit to his midsection late in Sunday's win over the Texans -- underwent X-rays afterward, but the signal-caller is evidently fine. It remains to be seen who might start for the Eagles if the team makes the playoffs, but with Carson Wentz still nursing a back injury, Foles -- who completed 35 of 49 passes for 471 yards, with four TDs and a pick Week 16 -- will continue to start for 8-7 Philadelphia. Foles completed 35 of 49 passing attempts for 471 yards, four touchdowns and one interception in Sunday's 32-30 win over the Texans. He also rushed once for one yard. Analysis: Foles came up clutch once again, leading the Eagles down the field for a game-winning field goal despite briefly leaving after a vicious hit by Jadeveon Clowney on the game's final drive. His 471 passing yards set the Eagles' mark for most in a single game. With the 29-year-old playing so well once again, it's tough to believe he won't get another start in a very winnable Week 17 matchup at Washington while Carson Wentz continues to recover from a back injury. Coach Doug Pederson named Foles as his starter for Week 16 against the Texans, Daniel Gallen of The Harrisburg Patriot-News reports. Foles competed 24 of 31 pass attempts for 270 yards, no touchdowns and an interception in Sunday's 30-23 win over the Rams. 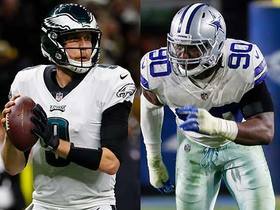 Foles will start Sunday against the Rams with Carson Wentz (back) ruled out for the contest, Zack Rosenblatt of NJ.com reports. Foles is in line to start Sunday's contest versus the Rams with Carson Wentz (back) doubtful to play, Dave Spadaro of the Eagles' official site reports. Foles could serve as the Eagles' starting quarterback Sunday against the Rams with Carson Wentz (back) uncertain to be available, Tim McManus of ESPN.com reports. Foles will return to a backup role after head coach Doug Pederson announced Monday that quarterback Carson Wentz (knee) has received full medical clearance and will reassume the starting job. Analysis: Foles was always considered a placeholder anyway while Wentz worked his way back from a torn ACL he sustained last December. The Super Bowl LII MVP completed roughly 66 percent of his passes in his two starts and was the serviceable option Philadelphia knew he would be, but Foles no longer has any fantasy appeal unless Wentz suffers some kind of setback down the road. Foles completed 35 of 48 passes for 334 yards with one touchdown and no interceptions in the Eagles' 27-21 loss to the Buccaneers on Sunday. He also rushed three times for eight yards and lost a fumble. Philadelphia head coach Doug Pederson said Wednesday that Foles would start at quarterback in the team's Week 2 game at Tampa Bay, Dave Spadaro of the Eagles' official site reports. Foles completed 19 of 34 passes for 117 yards with no touchdowns and one interception in the Eagles' 18-12 win over the Falcons on Thursday. He also logged a 15-yard reception, lost a yard on his sole rush and fumbled once but recovered. Foles is slated to draw the start at QB for the Eagles in Thursday's season opener against the Falcons. Analysis: The Eagles are wisely proceeding deliberately with Carson Wentz (knee), so Foles will draw at least one start for the team out of the gate. Foles is a serviceable Week 1 fantasy lineup plug-in, but note that he'll be working without top wideout Alshon Jeffery (shoulder), who is expected to miss the first two weeks of the season. The Eagles plan to start Foles in Thursday's season opener against Atlanta, Ian Rapoport of NFL Network reports. Analysis: Carson Wentz (knee) seems to be on the right track for a return early in the season, but Philadelphia understandably wants to be cautious with its franchise quarterback. Foles likely will be working without the assistance of WR Alshon Jeffery (shoulder), who is expected to miss the first two weeks of the season. Foles completed 13 of 17 passes for 127 yards and two interceptions during Thursday's 5-0 loss to the Browns. He also lost a fumble during the contest. Analysis: Foles tripped over himself for a safety, fumbled, floated an easy pick into double coverage, and then threw a second interception in the red zone. Foles will forever be a Philly legend, but he's turned the ball over four times in just over three quarters of action this preseason and has yet to lead the Eagles on a scoring drive. Franchise QB Carson Wentz (knee) has resumed 11-on-11 work, but it still has yet to be decided if he'll be cleared to play in Week 1. Foles likely will play the entire first half of Thursday's preseason game in Cleveland, Eliot Shorr-Parks of NJ.com reports. Foles (shoulder) practiced Sunday, NJ.com reports. Analysis: Coach Doug Pederson indicated that Foles is "fine" after suffering a shoulder strain Thursday against the Patriots. Meanwhile, Carson Wentz (knee) is ready to see 11-on-11 work, but his Week 1 status has yet to be solidified. Foles remains in the mix for early season action as long as that's the case, and it's possible a call on that front won't arrive until the week leading up to the Eagles' Sept. 6 opener against the Falcons. Tests on Foles' shoulder injury have revealed that his issue is a minor one, Ian Rapoport of NFL Network reports. Analysis: Though a precise timetable for Foles' return to action hasn't been outlined, the report suggests that a "prolonged recovery" isn't expected. Foles' short-term status is of utmost importance to the Eagles, since the Week 1 availability of Carson Wentz (knee) could go down to the wire. Foles will be sent for further tests on his shoulder Friday, Adam Schefter of ESPN reports. Foles (neck) is questionable to return to Thursday's game agaisnst New England after suffering a shoulder strain. Analysis: Foles was hit early and often during his time in Thursday's game, getting sacked three times while completing just 3-of-9 passes for 44 yards. Though he's questionable to return, it would be surprising to see the team risk his health in the preseason. Look for Nate Sudfeld to take some extra snaps while Foles is sidelined. Dave Spadaro of the Eagles' official site predicts Foles (neck) will play approximately one quarter of Thursday's preseason contest at New England. Foles (neck) is expected to play in Thursday's preseason game against the Patriots, Martin Frank of The Delaware News Journal reports. Analysis: Foles sat out this past Thursday's preseason opener while recovering from muscle spasms in his neck, but it looks as though he's past that issue and ready for some in-game reps. While Foles is clearly the Eagles' No. 2 QB, franchise signal-caller Carson Wentz is still bouncing back from a knee injury and acknowledged Tuesday that his Week 1 availability could turn into a close call. Foles (neck) will be a limited participant at practice Saturday, Ian Rapoport of NFL Network reports. Analysis: Foles didn't play in Thursday's preseason opener while recovering from muscle spasms in his neck, but a full return to practice shouldn't be too far off at this point. The team has no incentive to push Foles' return, especially with franchise quarterback Carson Wentz still working his way back from a knee injury. Foles is dealing with muscle spasms in his neck area, Martin Frank of the Delaware News reports. Analysis: The issue has kept Foles out of practice of late, but the QB is confident that he'll be fine before long. It's safe to assume that Foles won't be playing in Thursday's preseason opener, as there's no upside in pushing him, especially with franchise signal-caller Carson Wentz still working his way back from a knee injury. Foles (upper body) isn't practicing Tuesday and likely will be held out of Thursday's preseason opener against the Steelers, Jeff McLane of The Philadelphia Inquirer reports. Analysis: With Carson Wentz (knee) still a limited participant and Foles held out for a third straight day, the Eagles presumably will be left with Nate Sudfeld and Joe Callahan at quarterback for Thursday's game. There hasn't been any indication that Foles is dealing with a serious injury. Foles is dealing with unspecified "upper body soreness," Tim McManus of ESPN.com reports. Analysis: As a result, the QB was a spectator for Monday's practice. If things go as hoped, Carson Wentz (knee) will be able to reclaim the Eagles' starting QB role in time to get the starting nod Week 1, but Foles remains on hand, giving the team a highly capable contingency plan in the event that Wentz suffers any setbacks or is simply brought back slowly by the team with the long haul in mind. The Eagles and Foles agreed to a revised contract Friday, Mike Garafolo of NFL Network reports. Eagles coach Doug Pederson said the team hasn't come close to trading Foles, NJ.com's Eliot Shorr-Parks reports. Analysis: The incentive to make a trade largely evaporated March 17 when Foles collected a $3 million roster bonus. It now makes sense for the Eagles to take their time seeing how Carson Wentz recovers from a late-season ACL tear, perhaps revisiting a trade for Foles in August if their starter is on track for Week 1. The Eagles reportedly were targeting a first-round pick in exchange for the Super Bowl MVP. Foles will collect a $3 million roster bonus from the Eagles, Adam Schefter of ESPN reports. Analysis: The bonus already was fully guaranteed, but the Eagles could've avoided the cap hit if they'd traded Foles by Saturday. While this doesn't necessarily rule out a trade, the team presumably would have preferred to deal Foles before the bonus kicked in. It does make sense to keep him around, as there's no guarantee Carson Wentz will be recovered from a torn ACL in time for Week 1. Foles is drawing interest in trade talks, but the Eagles want even more than what they got for Sam Bradford, who was traded to the Vikings in September of 2016 in exchange for a 2017 first-round pick and a 2018 fourth-round pick, ESPN.com's Chris Mortensen reports. Foles completed 28 of 43 passes for 373 yards with three touchdowns and one interception in the Eagles' 41-33 win over the Patriots in Super Bowl LII on Sunday. He also caught a one-yard touchdown on a trick play late in the second quarter and was named the MVP of the game. Foles said his ribs are "great" in the aftermath of Sunday's 38-7 win against the Vikings, Daniel Gallen of pennlive.com reports. Foles underwent precautionary X-rays on his ribs Sunday following the Eagles' 38-7 win over the Vikings in the NFC championship game, a source informed Sal Paolantonio of ESPN. "I'm good," Foles told Adam Schefter of ESPN after being examined in the locker room. Foles was tremendous in Sunday's 38-7 NFC championship triumph over the Vikings, completing 26 of 33 passes for 352 yards and three touchdowns. Analysis: Minnesota's defense was able to make Foles uncomfortable in the pocket early, but he did a great job of escaping and finding receivers downfield. He was most impressive on third down, converting 10 of 14 tries against a Vikings unit that had been historically proficient at getting off the field in such situations. Foles' touchdown passes of 53, 41 and five yards to Alshon Jeffery, Torrey Smith and Jeffery again, respectively, should have him brimming with confidence heading into the Super Bowl. Foles completed 23 of 30 pass attempts for 246 yards in Saturday's 15-10 win over the Falcons. Analysis: Foles managed the game efficiently, completing an impressive 77 percent of his passes while posting a healthy 8.2 yards per attempt. He didn't find the end zone and mustered just one pass play longer than 21 yards, but he took care of the ball and avoided costly mistakes. Now that he's displayed that he can fill in competently enough to allow the team's other strengths to lead, Foles will lead the Eagles into next week's NFC championship game against either the Saints or the Vikings. Head coach Doug Pederson reiterated Tuesday that Foles will be the Eagles' starting quarterback during the postseason, Martin Frank of The Delaware News Journal reports. Foles completed four of 11 pass attempts for 39 yards and one interception prior to his removal Sunday against the Cowboys. Foles is expected to start and play about one quarter in Sunday's regular-season finale against the Cowboys, Les Bowen of the Philadelphia Inquirer reports. Analysis: With the Eagles locked in as the No. 1 seed throughout the NFC playoffs, head coach Doug Pederson can be judicious about using his starters, but understands Foles hasn't had much work with Philadelphia's recievers. He'll get enough work to stay sharp before he's pulled in favor of backup Nate Sudfeld. Foles was taking the first-team reps at Thursday's practice and indicated that he's preparing to start Sunday against the Cowboys, Jeff McLane of The Philadelphia Inquirer reports. Eagles head coach Doug Pederson suggested that Foles would start Sunday's game against the Cowboys, but the quarterback appears unlikely to play all four quarters, Martin Frank of The Delaware News Journal reports. Foles completed 19 of 38 passes for 163 yards, a touchdown and an interception in Monday night's 19-10 win over the Raiders. Analysis: Foles' performance was highlighted by a 17-yard touchdown pass to Jay Ajayi during the first quarter. Other than that, he struggled to move the ball Monday. While that raises concern ahead of the playoffs, Monday's victory allowed the Eagles to clinch the top seed in the NFC. With that place secured, it'll be interesting to see how Foles is managed in advance of Week 17's visit from the Cowboys. The Eagles might consider replacing Foles with Nate Sudfeld as soon as Week 16 against the Raiders, Jimmy Kempski of PhillyVoice reports. Foles completed 24 of 38 passes for 237 yards and four touchdowns during Sunday's 34-29 win over the Giants. Foles will start Sunday's game against the Giants and is expected to remain the Eagles' No. 1 quarterback the rest of the season after Carson Wentz (knee) was placed on injured reserve earlier this week, David George of the Eagles' official site reports. Foles entered Sunday's 43-35 win over the Rams in the fourth quarter in place of injured starting quarterback Carson Wentz (knee), completing six of 10 passes for 42 yards and gaining nine yards on a scramble. 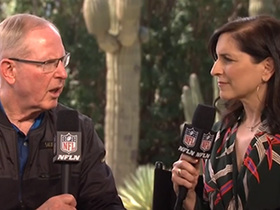 Jacksonville Jaguars vice president of football operations Tom Coughlin explains what new quarterback Nick Foles will bring to the Jacksonville Jaguars in 2019. NFL network's Tom Pelissero reports the latest on quarterback Nick Foles' contract situation heading into this offseason. Philadelphia Eagles executive vice president of football operations Howie Roseman discusses the future of quarterback Nick Foles. NFL Network's Nate Burleson explains why he is will be watching Philadelphia Eagles quarterback Nick Foles closely in the divisional round. 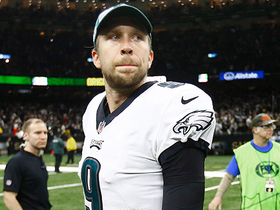 NFL Network's Peter Schrager and Nate Burleson debate whether the Philadelphia Eagles should stick with quarterback Nick Foles over Carson Wentz if Foles wins Super Bowl LIII. NFL Network's Mike Garafolo breaks down the bonuses Philadelphia Eagles quarterback Nick Foles can earn with each postseason win. 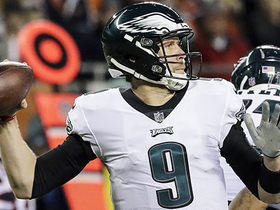 NFL Network's David Carr breaks down how Philadelphia Eagles quarterback Nick Foles got things done against the vaunted Chicago Bears' defense.